SELLAR, THOMAS, journalist; b. 20 Aug. 1828 at Elgin, Scotland, fourth of ten children born to Alexander Sellar, notary, and Isabella Grant; d. 27 Oct. 1867 in Montreal. Educated in Scotland, Thomas Sellar immigrated to Canada in July 1853. He found employment at the Toronto Globe, where he ran the counting room and became a lifelong confidant of George Brown*. A Protestant of staunch voluntaryist principles, he contributed articles on politico-religious subjects and was promoted to the post of sub-editor. With Brown’s backing he acquired the Brampton Weekly Times in Peel County, Canada West, dedicating his opening number of 6 March 1857 to the Grit platform, but the paper floundered within the year and was sold to George Tye. In January 1858 Sellar invested in part-ownership of the Toronto Echo and Protestant Episcopal Recorder, the anti-Romanist voice of the evangelical branch of the Church of England in Canada. Primarily a political writer, Sellar left editorial policy on church matters in the hands of prominent Anglican clergymen through whose efforts the struggling journal was periodically subsidized. 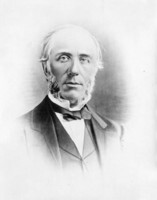 By 1860 he was sole owner of the Echo, and in 1861 moved its office from Toronto to the premises of the Montreal Herald. Sellar continued his association with the Globe by acting as its Montreal correspondent – an assignment that enabled him, by 1866, to work off a debt of $1,000 due George Brown. Hounded by creditors, he sought to augment his meagre income by contributing Canadian newsletters to British journals. In 1863 he induced his younger brother, Robert*, to found the Canadian Gleaner for Brown’s supporters in Huntingdon County, Canada East. Thomas was to receive a percentage of profits for writing the political editorials, but the Gleaner lost money and his connection with it was soon confined to its Montreal newsletter. He was, however, rewarded for these services to the Reformers with a welcome government appointment in October 1863 to issue marriage licences in Montreal. Despite his straitened circumstances, Sellar was active in the literary and social life of the city. In 1865 he was president of the Mercantile Literary Society, secretary of the Mercantile Library Association, and vice-president of the Caledonian Society, and in 1866 was admitted to the Victoria Masonic Lodge. He would seem to have enjoyed the esteem of his professional colleagues as well. He was a founding member of the Canadian Press Association in 1859, and served as secretary-treasurer until 1864, vice-president until 1866, and president from August 1866 until August 1867. Politically, he never deviated from the Grit ideals of representation by population and complete separation of church and state, and he opposed confederation as inimical to the interests of the British-Protestant minority of Canada East. His diary reveals him to have been a pious man of typically Victorian morality, constantly seeking God’s aid in a losing struggle to overcome such “besetting sins” as his unfortunate susceptibility to strong drink. He was in and out of love several times, but ultimately married Louisa Nichols (also written Nicolls in his diary), his faithful fiancée of seven years, at Jarvis, Canada West, on 6 July 1866. During that summer he contracted inflammation of the lungs, yet insisted on attending the annual convention of the Canadian Press Association at Goderich, Canada West, and the diocesan synod of the Church of England at Kingston. He died at the age of 39 shortly after his return to Montreal. The Echo, with a “very unsatisfactory” circulation of 1,200 scattered throughout the Province of Canada in 1866, was not continued after his death. PAC, MG 29, C86. Private Archives, Mr Keith Howden (Huntingdon, Que. ), diary of Robert Sellar, 1858–78. Canadian Gleaner (Huntingdon, Que. ), 1863–67. Echo and Protestant Episcopal Recorder (Toronto; Montreal), 1858–67. Gazette (Montreal), 28 Oct. 1867. Globe, 1861–67. Early Toronto newspapers (Firth). Morgan, Bibliotheca Canadensis. A history of Canadian journalism . . . (2v., Toronto, 1908–59), I. R. A. Hill, “Robert Sellar and the Huntingdon Gleaner: the conscience of rural Protestant Quebec, 1863–1919” (unpublished phd thesis, McGill University, Montreal, 1970). Robert Andrew Hill, “SELLAR, THOMAS,” in Dictionary of Canadian Biography, vol. 9, University of Toronto/Université Laval, 2003–, accessed April 26, 2019, http://www.biographi.ca/en/bio/sellar_thomas_9E.html.